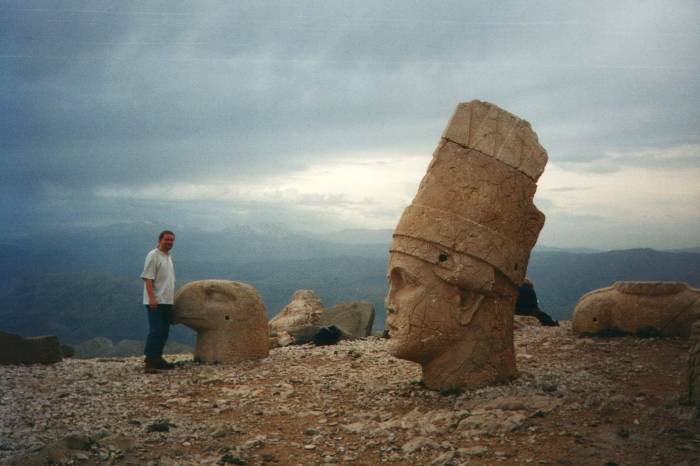 Nemrut Dağı, or Mount Nemrut, is a 2134 meter tall mountain in eastern Turkey, near Malatya, Adıyaman, and Kahta. Nemrut Dağı is topped by a strange collection of huge statues put there around 62 BC by Antiochos I Theos of Commagene, a megalomanical king. The collection of statues is a hierothesion, representing the king and his relatives, the gods of all the surrounding civilizations. Antiochus created a royal cult that could worship him after his death. It was based on the Greek form of the Persian religion Zoroastrianism. Several Greek inscriptions survive explaining Antiochus's religion and why he created it. 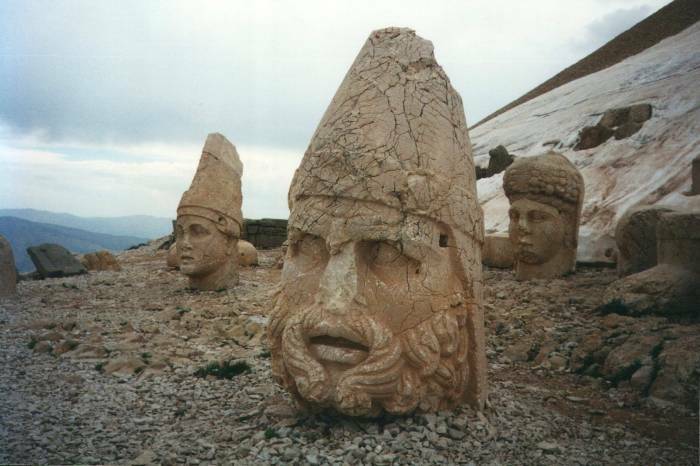 As for the mountain's name, "Nemrut" is much more recent and non-historical. It comes from an Armenian legend of the middle ages, in which the Armenian hero Hayk the Great defeated the Biblical king Nimrod. The Armenians equate Nimrod with Baal or Bel, a title given to several gods in Mesopotamian religions. The Kingdom of Commagene was an Armenian state that existed as an independent kingdom from 163 BC until 17 AD. It then alternated between being an independent kingdom and a Roman province until 72 AD, when Emperor Vaspasian made it part of the Roman Empire. It was a buffer state, between Armenia, Syria, Parthia, and Roman territory, with a culture that was a mix of the surrounding nations. Its kings claimed to be descendants of Darius the Great, Darius I of Persia. 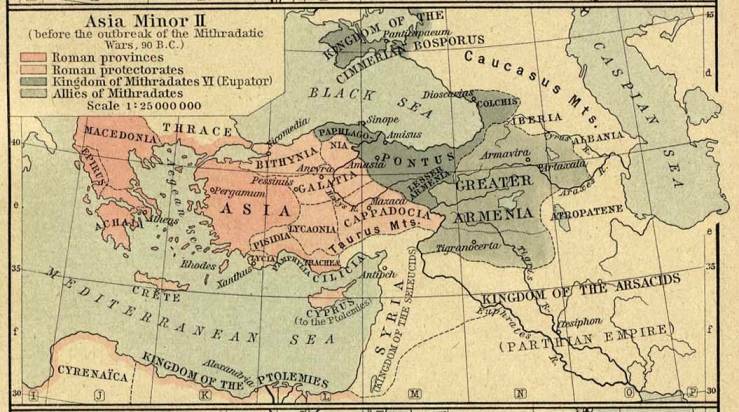 It doesn't appear at all on the first map below, showing Roman power in Asia Minor in 90 BC. It should be where the tip of Cappadocia extends into Greater Armenia. 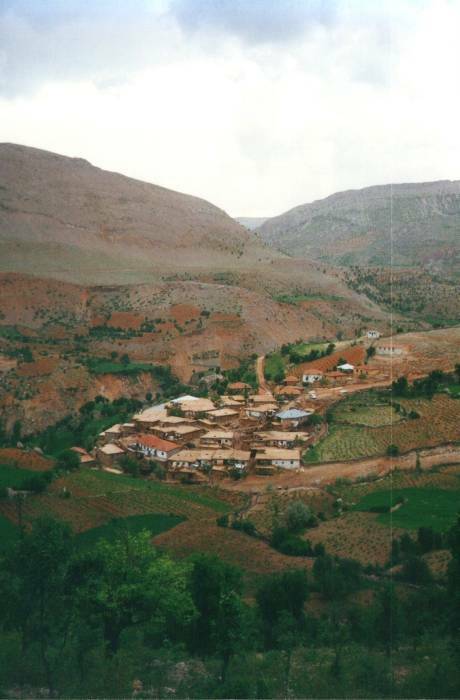 It's often described as lying between the Euphrates River and the Taurus Mountains. 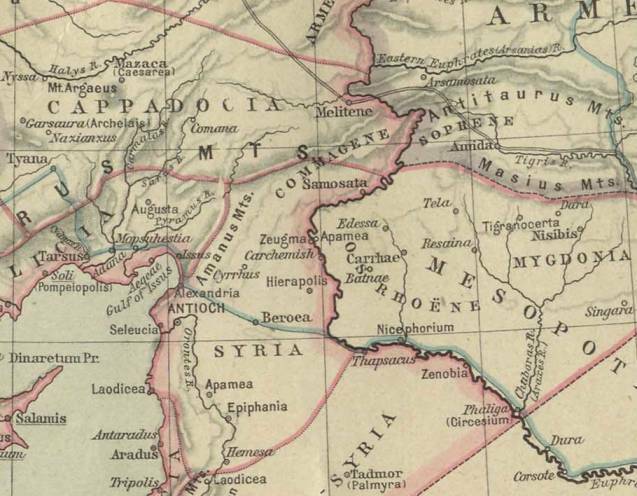 Its name appears on the second map, indicating an unbordered region where Cappadocia, Syria, Mesopotamia, and Armenia come together. Commagene was first mentioned as small Syro-Hittite kingdom. The Assyrian texts called it Kummuhu and described it as an ally of Assyria. Sargon II annexed it as a province of Assyria in 708 BC. Alexander the Great conquered the area in the 300s BC. Commagene became part of the Hellenistic Seleucid Empire when Alexander's short-lived empire broke up. Commagene became a state and province in the Seleucid Empire in 163 BC, just as that empire was coming apart. A year later its satrap, Ptolemy, declared himself the king of the independent Kingdom of Commagene. His descendant, Mithridates I Callinicus, embraced Greek culture and married a Syrian princess, thus claiming connections to both Alexander the Great and the kings of the Persian Empire. Mithridates's son and successor was Antiochus I Commagene. He ruled 70–38 BC. Antiochus was related to the Diadochi. That term was the lowest of official rank titles in Hellenistic times, but in the 19th century historians started using it to refer to the successors of Alexander the Great. Because of all the intermarriage in the families of both his father and mother, Antiochus was the direct descendant of five Diadochi — Seleucus I Nicator of the Seleucid Empire, Ptolemy I Soter of Egypt, Antigonus I Monophthalmus of Macedonia and Asia, Antipater the Macedonian regent, and Lysimachus of Thrace. He then married Princess Isias Philostorgos, daughter of King Ariobarzanes I of Cappadocia. Antiochus was just getting started. He took on the name of Άντίοχος ὀ Θεὸς Δίκαιος Έπιφανὴς Φιλορωμαῖος Φιλέλλην, or Antiochos I Theos Dikaios Epiphanes Philorhomaios Philhellen, or "Antiochus, a Just, Eminent God, Friend of Romans and Friend of Greeks". An eminent god, but a just and friendly one. Sort of the golden retriever of west Asian deities. He set up a royal cult so he could be worshipped after his death. It was based on the Greek form of Zoroastrianism, itself a Persian religion. He was to be entombed in a high and holy place. His tomb should be far from the people and close to the gods, of whom he was one. 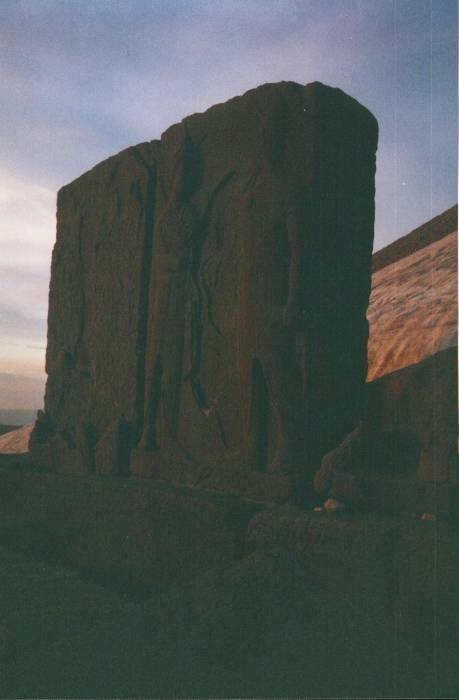 The gods of Commagene were based on the deities from the surrounding Greek, Armenian, and Iranian civilizations. Some of them blended aspects of similar deities from different religions. 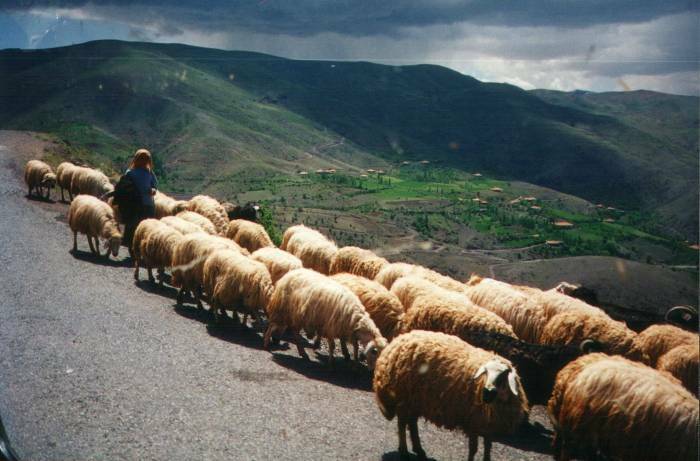 Cults of holy mountains were common among the Late Bronze Age Hittites and their Iron Age descendents. Local inscriptions in Luwian speak of kings named Suppiluliuma and Hattusili, lords of the land of Kummaha around 800 BC, who worshiped a sacred mountain named Hurtula. 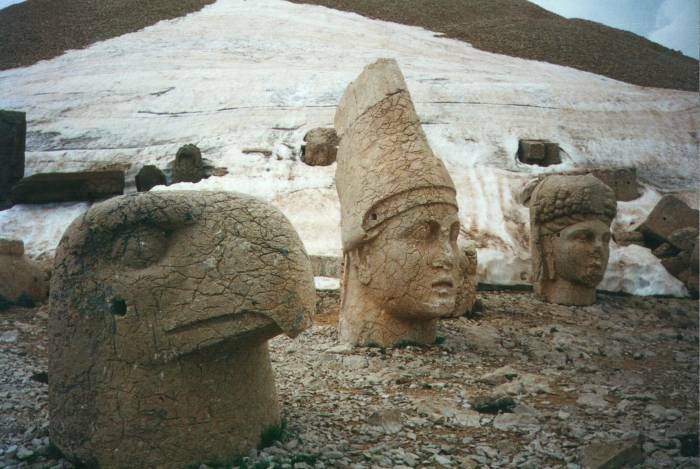 Kummaha was an earlier name for Commagene, Antiochus's kingdom, and Hurtula may have been Mount Nemrut, the tallest peak in Kummaha/Commagene. 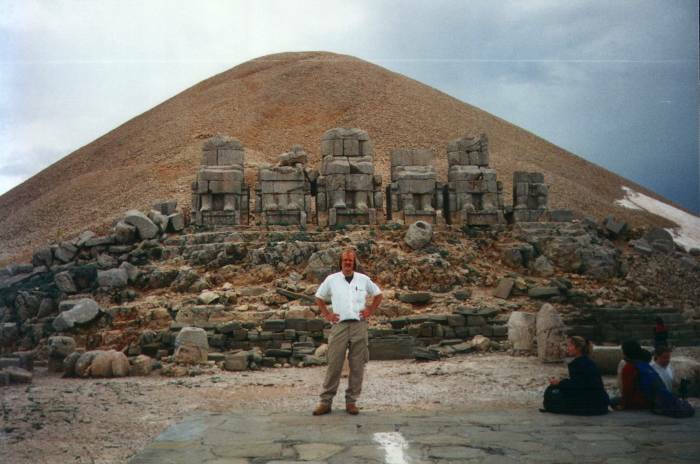 The complex at the peak of Nemrut Dağı was created by cutting away the peak, leaving a large horizontal platform. Then a tumulus was built, some 49 meters tall and 152 meters in diameter. Presumably there's a tomb under the tumulus. Status and carved slabs were placed on the remaining horizontal platform, which forms terraces around the tumulus. The collection of statues is a hierothesion. It represents the king and his relatives, who are (of course) the deities of all the surrounding civilizations. The limestone heads reflect the religions and artistic styles of surrounding nations. Clothes, headgear, and hairstyles are Persian. Physical representation is in the Greek style. From near to far: a Persian eagle god, Apollo / Mithra / Helios / Hermes, and a blend of the Greek Tyche and a Commagene goddess. The heads have all been removed from the statues. I'm standing on one of the broad terraces. Headless statues are behind me, and beyond that, the central tumulus. Despite the impressive level of megalomania, Antiochus intended for his religion to provide happiness and salvation to his followers. There were two feast days for Antiochus every year. His birthday, celebrated on the 16th day of the month of Audnayos, and the anniversary of his coronation, celebrated on the 10th day of the month of Loios. Priests were appointed, they and their descendants were to conduct the celebrations in perpetuity. The priests dressed in traditional Persian robes and placed gold crowns on the statues of Antiochus and his "relatives". They then offered incense, herbs, and sacrifices on altars in front of every image. All the people were invited to banquets celebrating the deceased king. Antiochus had decreed that "grudging attitudes" were forbidden, and everyone should enjoy themselves, eat, and drink wine, all while listening to sacred music performed by temple musicians. The construction and staff were funded from state properties. All this was not sustainable. The kingdom fell soon after and the site was completely forgetten. It was only rediscovered in the late 1800's when the Germans were surveying for a railroad they were building for Turkey. 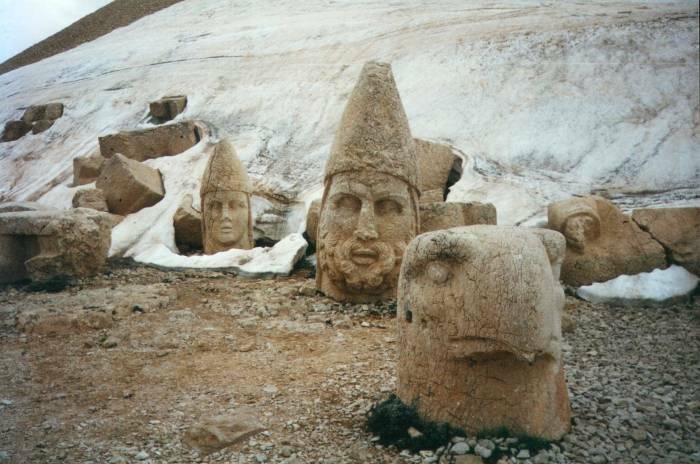 Mount Nemrut is now a UNESCO World Heritage Site. 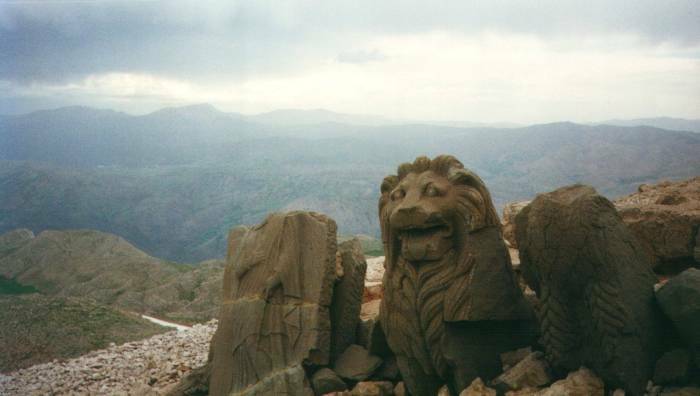 You can visit Nemrut Dağı on trips out of Malatya and Kahta. You drive up the mountain in the day, visit the site in late afternoon and watch sunset, then retire to a hotel near the summit. In the morning you get up early to see sunrise from the summit. Then it's breakfast at the hotel and back down the mountain in the late morning. 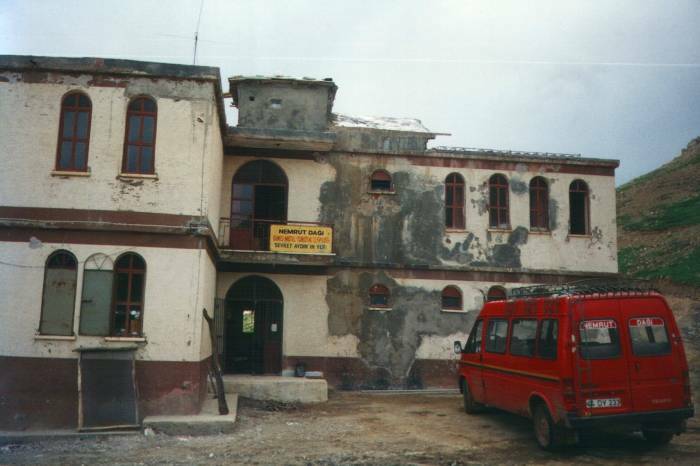 These pictures show a trip up from the north side, from Malatya. 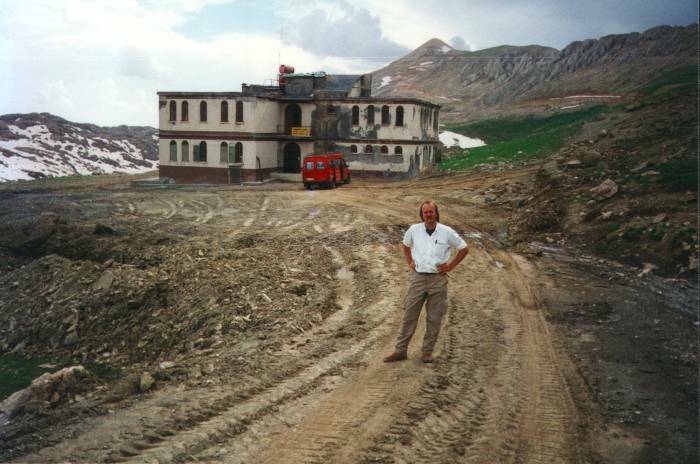 I had arrived on a bus out of Göreme, in Cappadocia, after exploring the fantastic landscape in that area. Make way for the local traffic! We're passing a local shepherd as we make our way up the mountain. Below, we have stopped for a break along the mountain road. That's our large van and our group on the bridge. Beyond the van you see a local home. 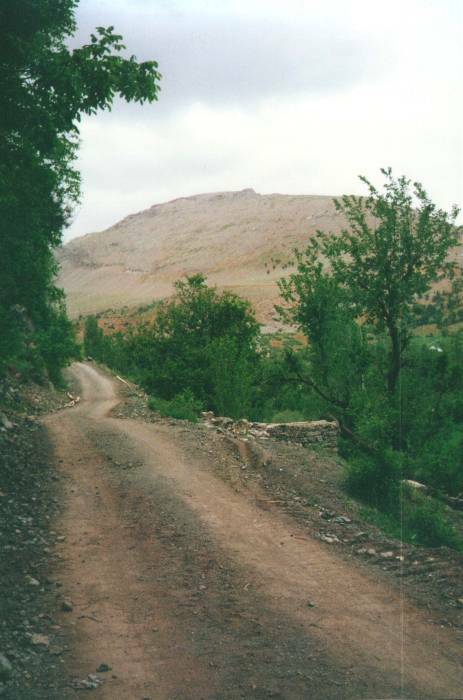 And beyond that, above the thin poplar trees, the lower slopes of Nemrut Dağı climb toward the summit. We are continuing along the road up the mountain. It dropped to a single lane soon after we turned off the highway from Malatya. We're climbing beyond a small mountain village. This was the last settlement on our way up. We have arrived near the summit! The hotel is in sight, and the summit is beyond and to its left. Notice the conical shape of the summit — that's the burial mound or tumulus of Antiochos I Theos Dikaios Epiphanes Philorhomaios Philhellen of Commagene. The German railway engineers discovered the site when they were sighting mountaintops through a surveying transit. And yes, that's snow, and these pictures were taken in early June, right after the roads had opened for the brief summer season. 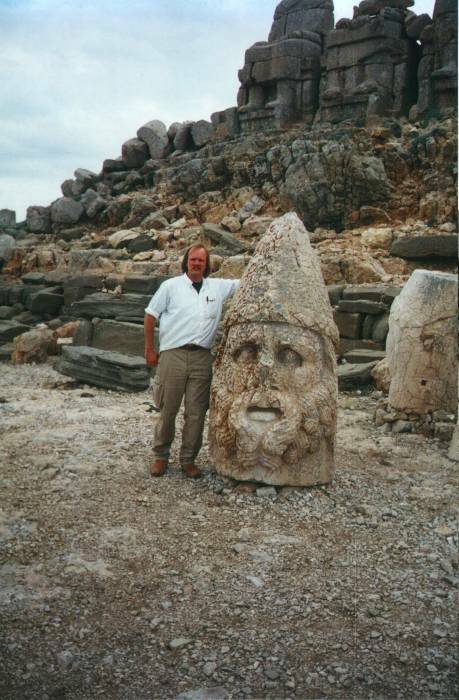 Most people visit Nemrut Dağı in June, July, and August, when it's practical to do so. I'm in front of the hotel with the summit visible beyond it. Yes, it's a little bleak up there, but that's part of the appeal. The hotel itself could use a coat of paint. 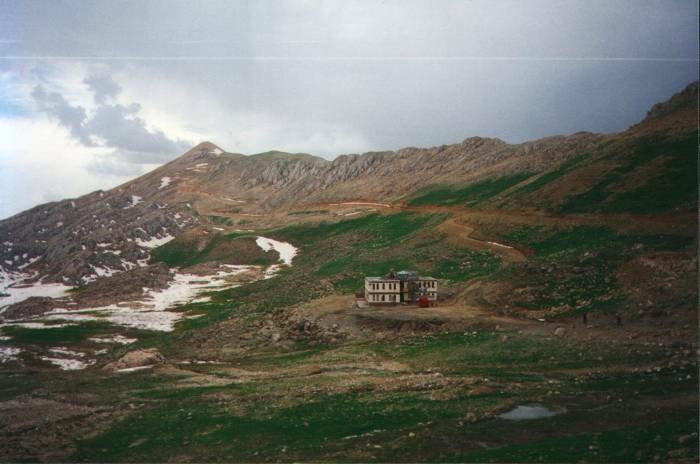 Mountain winters are rough in eastern Turkey, and it's hard to build and maintain a structure up here. We're walking around the hotel to get loosened up after the long ride. Soon it will be time to hike the rest of the way to the summit. The statues have lost their heads over the years. Eastern Turkey is geologically active and there are many earthquakes in the region. Originally the statues were seated in a row, flanked by a lion and an eagle on each side. The conical summit tumulus is 49 meters tall and 152 meters in diameter. Art historians point out that the statues have Greek facial features, but Persian clothing and hairstyles. 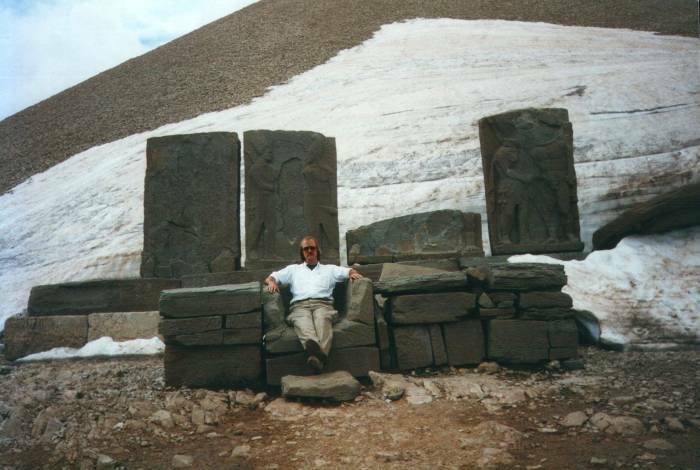 The kingdom of Commagene was in the mountains between ancient Greek, Persian, and Armenian civilizations, and so their art borrowed from all of them. The first picture below shows Heracles / Vahagn / Artagnes in the foreground; then either Antiochos himself or else Apollo / Mithra / Helios / Hermes in the Phrygian cap to the left, and a blend of the Greek goddess Tyche and the all-providing goddess Commagene to the right. There are spectacular views over wide areas of eastern Turkey, including the areas where both the Tigris and Euphrates rivers begin. There are bas-relief carvings, thought to have formed a large frieze. They show ancestors of Antiochus, both real and imaginary. One of the bas-relief carvings shows an alignment of stars and the planets Jupiter, Mercury and Mars on 7 July 62 BC. This might indicate the time when construction began on this monument. See the paper here for an alternative analysis suggesting that the monument "represents the sky at special moments of the year 49 B.C." Those authors found that the eastern terrace was not aligned with the direction of the sun's rise on the summer solstice, as had been assumed, but was almost 6° away. This would be the direction of the rising of Regulus during the time of Antiochus' reign, which led them to some unusual conjunctions around Regulus during this general period and a possible connection to the design of the hierothesion. Also new festivals for the worship of the gods and our honors will be celebrated by all the inhabitants of my kingdom. For my body's birthday, Audnayos the 16th, and for my coronation, Loios the 10th, these days have I dedicated to the great diamones' manifestations who guided me during my fortunate reign. [...] I have additionally consecrated two days annually for each festival. The daimones were the divinities represented in the statues. The low light at sunset can make it easier to see some of the details on parts of the frieze. Some of these sandstone friezes contain the oldest known images of dexiosis or two figures shaking hands, pushing back the origin of that social interaction. J.M. DeBord has written Something Coming, a novel set at Nemrut Dağı and featuring King Antiochos I Theos. 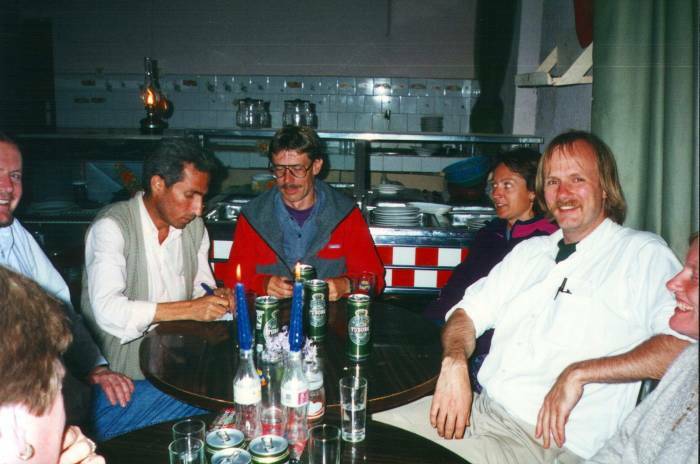 We hang out in the hotel's dining room after dinner. We will get up early the next morning to hike back to the summit in the dark and witness sunrise from the summit of Nemrut Dağı. 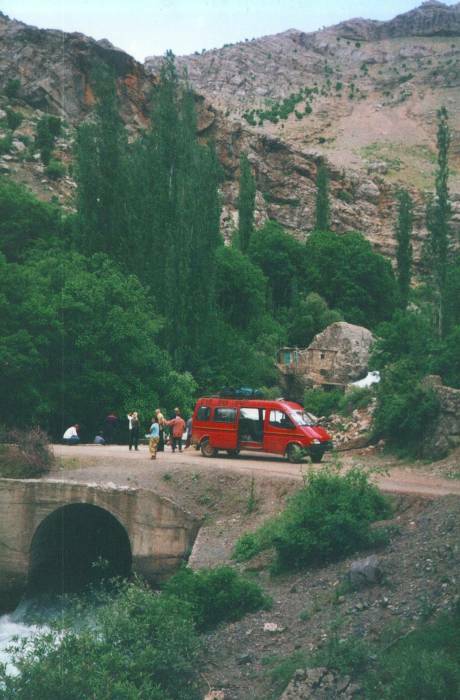 Then it's back down to the hotel for breakfast, and into the van for the ride back to Malatya. 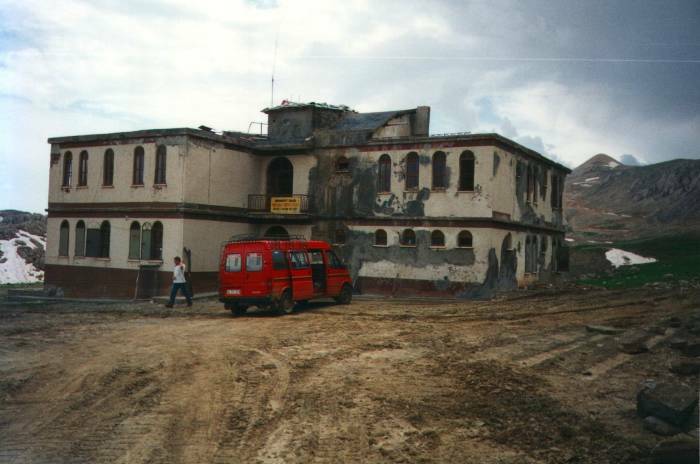 I stayed at the Otel Sihan in Malatya. It's at Atatürk Caddesi #16, +90-(0)422-321-29-07. At the time rooms were US$ 4/6 for single/double with shower and toilet. The Otel Tehran was nearby and similarly priced, but the Otel Sihan seemed significantly nicer. Arfentour runs the trip up Nemrut Dağı, it was a great trip! They were at Atatürk Caddesi #40/B, +90-(0)422-325-55-88.